Float paints on water, make designs in them, then pick up on paper. Note: uses acrylic paints. Add 1 Tbspn carrageenan to 4 pints of water (or scale up) and mix until dissolved - it will take a while. For other size thickeners (e.g. "Methocel") follow manufacturers instructions. Marbling size can be kept in the fridge for months, even after using. Add 3 Tbspns alum to a pint of water and shake to dissolve. Warm water speeds the process. Mordant can be stored for long periods. Mark one side of the drawing paper with an X or other mark, to indicate which side of the paper does not have mordant on it. Use a spray bottle or sponge applicator to cover the unmarked side of the drawing paper with the alum mordant. Allow to dry. Mordanted paper can be kept for long periods until use. If necessary, cut the paper so that it fits in the tray with room to spare. Mix the chosen acrylic paint colours (two or more contrasting colours works well) with water until smooth. Surfactant can be added according to the manufacturer's instructions if the paints to not spread on the size well. I find that some colours spread well, and others not so well, so I add the more-spreading paints after the others. Pour the prepared size into the tray. Use the pipette to drip paint onto the size, first one colour then another. Do not squirt large amounts of paint into the tray - it will just sink to the bottom - but add drop by drop allowing each to spread out on the surface of the water. If one colour does not spread so much, drip a more-spreadable colour on top of it. If this still does not work add some surfactant to the paints that will not spread (or make another colour that does). Once the surface of the size has several colours, use a stylus to drag the paint around to make swirling patterns. The patterns can be regular repeating patterns, or more random designs. Be careful not to overwork the paint - simpler patterns are often more effective. Lay the paper onto the paint, mordanted side down touching the paint (therefore the marked side up) using this technique: bend the paper slightly downwards in the centre, lay the centre on the paint, then swiftly but smoothly lay the rest of the paper down, ending at the sides. This makes sure that no air bubbles are trapped under the paper (which will leave white holes in the design). Lift the paper off the paint, in one smooth motion, then place face up in a second tray. Run some water into the side of the tray (not directly on top of the paper), then swish the water over the paper to rinse the excess paint off, and to remove the size still on the paper. Dump the water and swish again until the water runs clear. Ideally hang the marbled paper on a drying rack to dry (so that any remaining excess paint will run off). Or lay on sheets of newspaper. 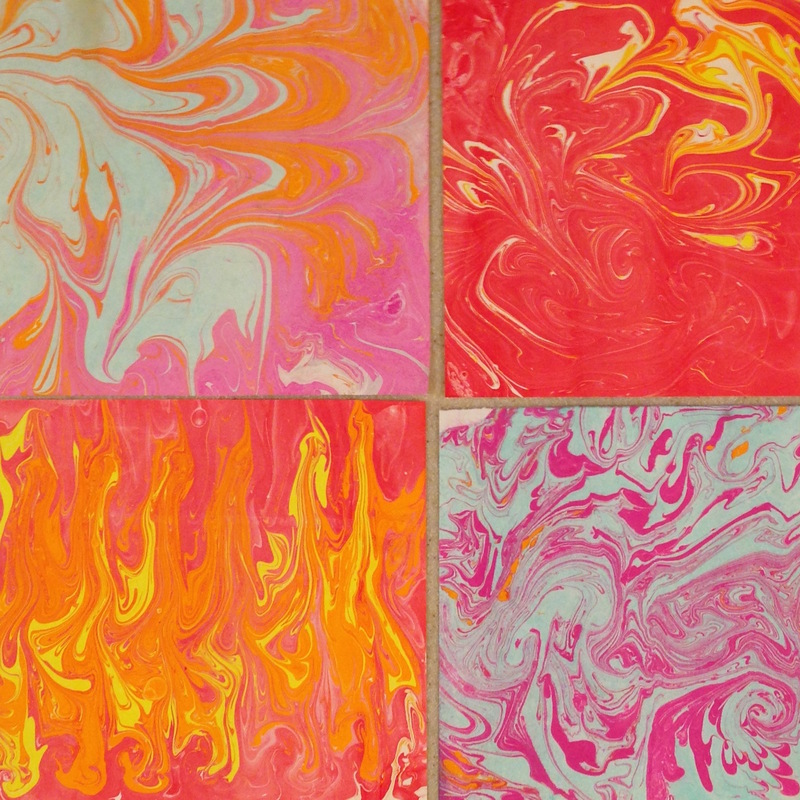 Make cards or other designs from the marbled paper. Trimming off the less attractive parts will make the art look professional.